Michael Raynor and Mumtaz Ahmed recently published an article in Harvard Business Review describing Three Rules For Making a Company Truly Great. This study collected data on 25,000 US publicly traded companies between 1966 and 2010 with a focus on long run Return on Assets (ROA) performance because it reliably reflects management actions and levers within their control. The best performing firms were labelled ‘Miracle Workers’ with ROA in the top 10% , the next ‘Long Runners’ with ROA in the top 20-40%, and ‘Average Joes’ with consistently lower ROAs. The results of this study provide insight into how firms that successfully manage the Delivery-Innovation Paradox achieve superior long run results. Although the study covers a vast array of different firms the three rules does suggest how managers of firms that leverage engineering talent (or advanced technology firms) could use the rules as a decision compass to prioritize and sequence delivery and innovation improvement investments for long run company success – A Delivery/Innovation Investment Compass. Raynor and Ahmed suggest that management should apply the rules to allocate scarce resources amongst competing priorities as they make investment decisions from year-to-year. To help clarify how management can put the rules into action, Raynor and Ahmed’s performance categories can be mapped into a simple 2×2 framework that illustrates value creation and value capture. 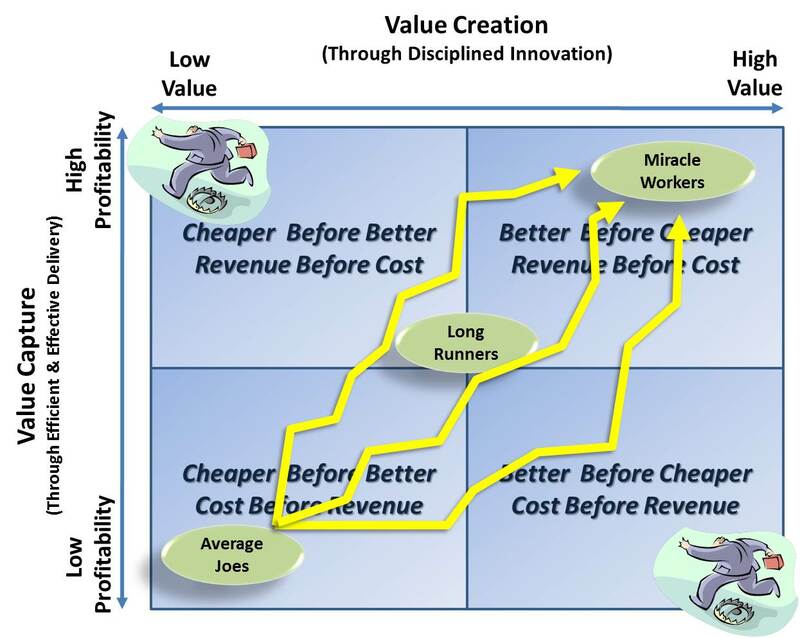 The ‘miracle workers’ were firms that consistently in the long run selected steps to be better before cheaper and revenue before cost to maximize value creation and value capture. The ‘Average Joes’ were firms that consistently in the long run selected steps be cheaper before better and reduce cost before improve revenue. The ‘Long Runners’ were firms that consistently fell within these extremes. For superior performance, the first rule leads management to take steps for their firms to compete on non-price value creation (ie. to be ‘better’) rather than competing on low price (ie. to be ‘cheaper’). To be ‘better’ the authors suggest that firms should invest in continuously improving the non-price benefits of their offerings such as great brand, exciting style, excellent functionality, durability, convenience, selection, or any other market relevant sources of value. By extension then this implies that for technology firms to be ‘better’ than their competition management need to invest wisely and appropriately through disciplined innovation to create value – product innovation, business model innovation, marketing innovation, or process innovation. For superior performance the second rule prioritizes value capture by putting increased revenue (either higher price or higher volume) ahead of reducing costs. To put this into action this rule is really speaking to the importance of the efficiency and effectiveness of delivery by the business to achieve profitability. To deliver more efficiently and effectively firms need to invest in initiatives that would yield higher grow margins, lower SG&A to sales ratio, lower capital to sales ratio, or higher market share. There are no other rules so change anything you must to follow rules 1. and 2. 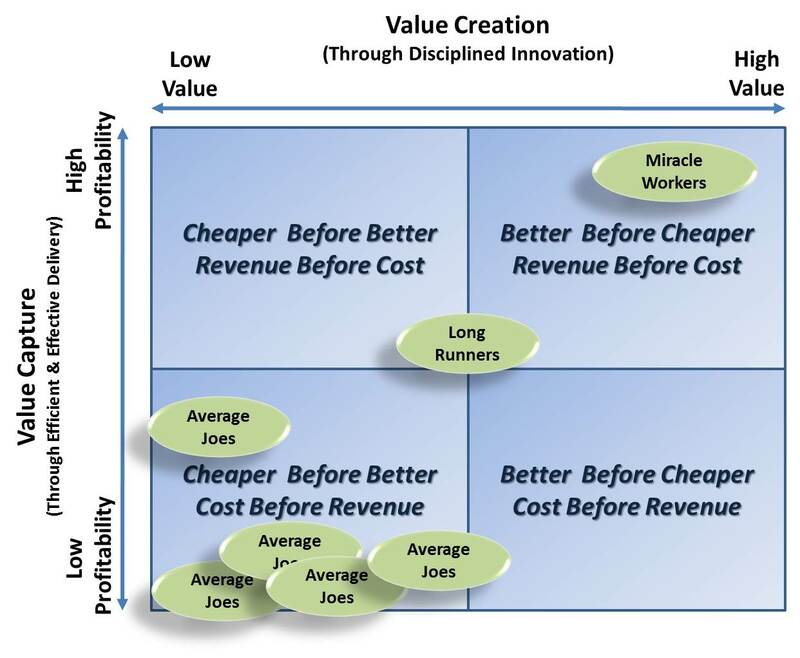 In the long run the 2×2 matrix suggests the 3 rules can be used as a guiding compass as the firm evolves along paths taking them from the ‘Average Joe’ level of performance to the ‘Miracle Worker’ level of superior performance. Poor Innovation Execution Trap – Management continuously prioritizing innovation over delivery leading to poor execution – value creation without value capture. Either trap will lock their firms in a perpetual ‘Average Joes’ level of performance or business failure. Over time then the optimum path is an incremental ‘zig-zag’ through the middle interrupted by market disruptions and changes – or reminding one of the game of snakes & ladders. The authors also note through examples when management stop following these rules that performance suffers and the path can take them back down. The 2×2 framework is perhaps an over simplification of some fairly obvious business principles but it helps to reset management’s thinking if they get lost in the details. To achieve long run superior performance the results of this study suggests that managers need continuously balance and sequence innovation and delivery investments – the three rules provides a delivery / innovation compass to help guide management investment decisions year-over-year and in response to competitive dynamics. This entry was posted in Delivery - Innovation Paradox, Innovation on April 14, 2013 by Andrew Reif.